Forty-three years after Green Beret and Army medic James Leslie Moreland went missing in action in Vietnam, the young soldier is coming home. Moreland’s unit was attacked by the North Vietnamese Army in February 1968 at Lang Vei. He was mortally wounded. But while the battle left some of his comrades dead, Moreland was never found. Until now. His remains will be flown home in May and buried in Alabama, beside his parents’ graves, she said. 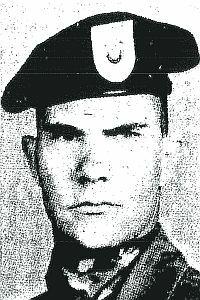 Moreland, known as “Les” to his fellow soldiers, was only 22 when he was killed but his story touched people he would never meet. Hughes learned of Moreland when he found a metal memorial plaque with Moreland’s name on it lying in some bushes in the 2100 block of South Hacienda Boulevard. After learning who Moreland was, Hughes and the HHIA had a concrete monument built and remounted the plaque in his honor. Hughes knew Moreland was MIA and never forgot about him. Read more about the fallen soldier at Moreland. Police arrested a 48-year-old Rowland Heights man Friday on suspicion of molesting a 15-year-old Redlands boy over several months. The man met the teen in an online chat room, according to a news release issued by city spokesman Carl Baker. Officers arrested Joe Phillip Morales in Highland. Family members told police the boy and girl were with Morales but they did not know their location, according to the news release. Officers found the teens three days later in San Diego and returned to Redlands. Police interviewed the juveniles and learned the name of the suspect. Morales was arrested for multiple lewd acts with the boy spanning from November 2010 to February 2011. Read Jesse Gill’s story at LEWD. What do you want to do when you grow up? Some people know what they’ll become as early as 5 years old. For others, their jobs come as complete surprises, the hand of fate directing them on their career path. 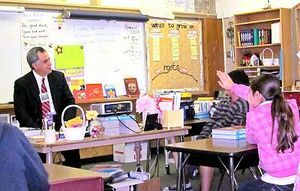 Newton Middle School students heard from both camps during a career day on Feb. 24. Some of the speakers had always known what they wanted to be, while others hadn’t had a clue. A couple were even in between. But the professionals were all entertaining as they discussed their careers with the preteens. The one thing they all shared in common seemed to be their love for their profession. A judge, a principal and a saleswoman share their stories in Richard Irwin’s story at CAREERS.